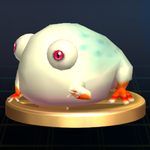 This article is about the white frog-like enemy. For the yellow variant, see Yellow Wollywog. Wollywogs (マロガエル?, lit. : "Chestnut Frog", also known as Wollyhops) are a species of frog-like creatures found in the first two Pikmin games that live in the bowels of subterranean areas. As an adaptation to environments with little or no sunlight, they have lost most of their skin pigmentation, giving them an albino-like appearance. Frequently found in or near a body of water, Wollywogs are slow and stocky creatures. Generally passive, they will only attack by leaping into the air if a leader or Pikmin comes nearby. Once on the attack, a Wollywog will likely not pursue if its target is on the move, rather it will return to its general starting location in short hops. Their attacks are sometimes sudden, and they can shake all attacking Pikmin from their bodies. Upon falling, a Wollywog's attack covers a considerable radius, killing all Pikmin within it. Even if a Wollywog is defeated as it is about to fall, any Pikmin caught beneath it will still be killed. Such an attack can be prevented if the Wollywog is weighed down with at least 10 or so Pikmin. Compared to their counterparts, the Yellow Wollywogs, Wollywogs jump with less vertical movement, but greater horizontal movement. They also have slightly less health. Wollywogs are changed little behaviorally. They are in general slightly weaker than they are in Pikmin, with less hit points, a smaller radius on their attacks, and being easier to weigh down. Also, when one is killed midair, the falling body will not kill any Pikmin beneath it. Because they tend to dwell in darker areas, they are now only found in caves. They actually have more health than Yellow Wollywogs in this game, and can notice a player from anywhere, unlike the Yellow Wollywogs. Swarm it with a large group of Pikmin. The more Pikmin are attacking at once, the more likely the Wollywog will be weighed down and unable to jump (50 or more will keep it grounded almost every time). If it does get airborne, call back the Pikmin and get them away from the Wollywog's shadow (the area where it will land). Re-swarm when it lands. Note this strategy can cause the crushing glitch to occur. An alternative method is to get two Yellow Pikmin and give each a bomb-rock. Throw an armed Yellow Pikmin into the Wollywog's vicinity and the Wollywog will target the Pikmin. When it does, immediately call back the Pikmin and by the time it lands, the bomb-rock will explode next to it. Repeat once more to kill it. In the New Play Control! version of the game, as Pikmin no longer drop the bomb-rocks when whistled at, a bomb-holding Pikmin must be thrown close to the Wollywog while it is in the air so the Pikmin throws it while it is on the ground. The alternative strategy mentioned for Pikmin 2 also works here, but it takes longer than swarming, since throwing is slower on the first game. Swarming is less effective here, so attack by repeatedly throwing Pikmin, preferably Purple Pikmin, onto its back. It appears to be easier to pin the Wollywog to the ground here than in Pikmin, so it is in fact easier to kill. Once again, in the event that it does get off the ground, call the Pikmin back immediately and move them out of the way. An alternate strategy (if you don't have Purple Pikmin) is to use a group of about 10-20 Pikmin, and throw all the Pikmin before the Wollywog takes off. It should become airborne, and the moment it starts to land, recall the Pikmin. Because of the falling speeds of Pikmin and the Wollywog, and the fact that Pikmin are invincible when airborne, this is a very viable strategy. "Standard Wollywogs are pale because they never get any sun. You'll find them underground areas exclusively, and often in the water. Attack the hoppers with small squads of tossed Pikmin. If you swarm them, chances are some of your troops will get squashed." The Wollywog appears as a trophy in Super Smash Bros. Brawl. “A member of the amphituber family known to be quite quick witted upon spotting enemies, despite its slow-moving, easygoing nature. Be aware that wollywogs will make aggressive attempts to smash Pikmin. It is believed that the wollywog's whitish coloration is a result of a lack of sunlight over its generations spent in caves. Like the Yellow Wollywog and Wogpole, this enemy had to be renamed to "Wollyhop" for the European version of New Play Control! Pikmin and New Play Control! Pikmin 2. The creature's Japanese name is マロガエル?, which could translate to "Chestnut Frog". マロン? is a French word for chestnut (marron), which is apt, given the creature's appearance, but the word ガエル? is similar to the word カエル?, which means frog. Its scientific name is Amphicaris albino. Albino refers to the creature's pale skin and red eyes. In Pikmin, it is internally known as frow, which is frog (the Yellow Wollywog's internal name) but with w, likely short for "white", standing in for the last letter. In Pikmin 2, the internal name is marofrog; "maro" is a part of its Japanese name. In the GameCube Interactive Multi-Game Demo Disc Version 18, this enemy's genus name is mistakenly the same as the Water Dumple's, making its scientific name Ichthyosa Albino. A Wollywog in the enemy reel of Pikmin. The creature renamed to "Wollyhop" in the European enemy reel of New Play Control! Pikmin. A Wollywog in the Piklopedia of Pikmin 2, rubbing its face. The Wollywog's back. Notice its "tail". Wollywogs and Yellow Wollywogs in the unused Last_4 cave of Pikmin 2. The creature's e-card, #48 (5th blue card). The Wollywog and an alternate version with a crystal under its stomach were meant to appear in Pikmin 3, but their data remains unused. The Shearwig and the Wollywog can inflict the most damage to leaders in Pikmin 2: 40% of their health without the Metal Suit Z, and 20% with the Metal Suit Z. This page was last edited on December 21, 2018, at 13:44.